About a month ago I heard about GOG.com. The site - its URL is an acronym for "Good Old Games" - is dedicated to promoting classic computer games from years gone by. So with a lot of folks raving about how good Fallout 3 is since it came out last month and because I never played the original, I purchased Fallout (shown at left) from GOG.com for $5.99 earlier this week. For that amount came not only the game as a 500 megabyte download, but also the manual and a lot of other Fallout-related goodies (like the soundtrack). And after the last few days of traipsing around the blasted wasteland of Fallout, I now forsee giving GOG.com plenty more of my coin in the future. In addition to Fallout and Fallout 2 (also for six bucks) the site's catalogue features Descent and its sequel, MDK, Earthworm Jim 3D, Unreal Gold, and many others. 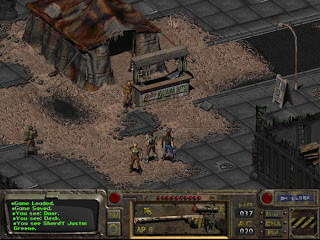 All of the games sold through GOG.com are free of digital rights management (for which a lot of people will be happy) and they are guaranteed to work on Windows XP and Vista (I've been playing Fallout on a Vista machine and trust me: it plays perfectly!). The site is still in beta, but if GOG.com is as consistent with its word as it has been so far, I will certainly recommend checking them out on a regular basis.